This weekend's attempted Times Square bombing reminded us of the dangers of "the workhorse of urban terrorism" — the car bomb. Mike Davis gave TomDispatch this history of the first modern car bomb, mere miles from Times Square. —Ed. "You have shown no pity to us! We will do likewise. We will dynamite you! 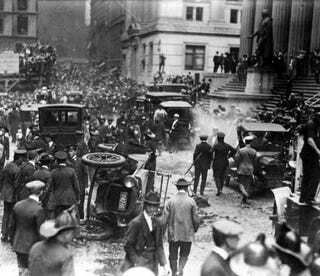 On a warm September day in 1920, a few months after the arrest of his comrades Sacco and Vanzetti, a vengeful Italian anarchist named Mario Buda parked his horse-drawn wagon near the corner of Wall and Broad Streets, directly across from J. P. Morgan Company. He nonchalantly climbed down and disappeared, unnoticed, into the lunchtime crowd. A few blocks away, a startled postal worker found strange leaflets warning: "Free the Political Prisoners or it will be Sure Death for All of You!" They were signed: "American Anarchist Fighters." The bells of nearby Trinity Church began to toll at noon. When they stopped, the wagon — packed with dynamite and iron slugs — exploded in a fireball of shrapnel. "The horse and wagon were blown to bits," writes Paul Avrich, the celebrated historian of American anarchism who uncovered the true story. "Glass showered down from office windows, and awnings twelve stories above the street burst into flames. People fled in terror as a great cloud of dust enveloped the area. In Morgan's offices, Thomas Joyce of the securities department fell dead on his desk amid a rubble of plaster and walls. Outside scores of bodies littered the streets." His Wall Street bomb was the culmination of a half-century of anarchist fantasies about avenging angels made of dynamite; but it was also an invention, like Charles Babbage's Difference Engine, far ahead of the imagination of its time. Only after the barbarism of strategic bombing had become commonplace, and when air forces routinely pursued insurgents into the labyrinths of poor cities, would the truly radical potential of Buda's "infernal machine" be fully realized. Buda's wagon was, in essence, the prototype car bomb: the first use of an inconspicuous vehicle, anonymous in almost any urban setting, to transport large quantities of high explosive into precise range of a high-value target. It was not replicated, as far as I have been able to determine, until January 12, 1947 when the Stern Gang drove a truckload of explosives into a British police station in Haifa, Palestine, killing 4 and injuring 140. The Stern Gang (a pro-fascist splinter group led by Avraham Stern that broke away from the right-wing Zionist paramilitary Irgun) would soon use truck and car bombs to kill Palestinians as well: a creative atrocity immediately reciprocated by British deserters fighting on the side of Palestinian nationalists. Hezbollah's ruthless and brilliant use of car bombs in Lebanon in the 1980s to counter the advanced military technology of the United States, France, and Israel soon emboldened a dozen other groups to bring their insurgencies and jihads home to the metropolis. Some of the new-generation car bombers were graduates of terrorism schools set up by the CIA and Pakistani intelligence (the ISI), with Saudi financing, in the mid-1980s to train mujahedin to terrorize the Russians then occupying Kabul. Between 1992 and 1998, 16 major vehicle bomb attacks in 13 different cities killed 1,050 people and wounded nearly 12,000. More importantly from a geopolitical standpoint, the IRA and Gama'a al-Islamiyya inflicted billions of dollars of damage on the two leading control-centers of the world economy — the City of London (1992, 1993, and 1996) and lower Manhattan (1993) — and forced a reorganization of the global reinsurance industry. In the new millennium, 85 years after that first massacre on Wall Street, car bombs have become almost as generically global as iPods and HIV-AIDS, cratering the streets of cities from Bogota to Bali. Suicide truck bombs, once the distinctive signature of Hezbollah, have been franchised to Sri Lanka, Chechnya/Russia, Turkey, Egypt, Kuwait, and Indonesia. On any graph of urban terrorism, the curve representing car bombs is rising steeply, almost exponentially. U.S.-occupied Iraq, of course, is a relentless inferno with more than 9,000 casualties — mainly civilian — attributed to vehicle bombs in the two-year period between July 2003 and June 2005. Since then, the frequency of car-bomb attacks has dramatically increased: 140 per month in the fall of 2005, 13 in Baghdad on New Year's Day 2006 alone. If roadside bombs or IEDs are the most effective device against American armored vehicles, car bombs are the weapon of choice for slaughtering Shiite civilians in front of mosques and markets and instigating an apocalyptic sectarian war. Under siege from weapons indistinguishable from ordinary traffic, the apparatuses of administration and finance are retreating inside "rings of steel" and "green zones," but the larger challenge of the car bomb seems intractable. Stolen nukes, Sarin gas, and anthrax may be the "sum of our fears," but the car bomb is the quotidian workhorse of urban terrorism. Before considering its genealogy, however, it may be helpful to summarize those characteristics that make Buda's wagon such a formidable and undoubtedly permanent source of urban insecurity. First, vehicle bombs are stealth weapons of surprising power and destructive efficiency. Trucks, vans, or even SUVs can easily transport the equivalent of several conventional 1,000-pound bombs to the doorstep of a prime target. Moreover, their destructive power is still evolving, thanks to the constant tinkering of ingenious bomb-makers. We have yet to face the full horror of semi-trailer-sized explosions with a lethal blast range of 200 yards or of dirty bombs sheathed in enough nuclear waste to render mid-Manhattan radioactive for generations. Third, car bombings are operationally simple to organize. Although some still refuse to believe that Timothy McVeigh and Terry Nichols didn't have secret assistance from a government or dark entity, two men in the proverbial phone booth — a security-guard and a farmer — successfully planned and executed the horrendous Oklahoma City bombing with instructional books and information acquired from the gun-show circuit. Fourth, like even the 'smartest' of aerial bombs, car bombs are inherently indiscriminate: "Collateral damage" is virtually inevitable. If the logic of an attack is to slaughter innocents and sow panic in the widest circle, to operate a "strategy of tension," or just demoralize a society, car bombs are ideal. But they are equally effective at destroying the moral credibility of a cause and alienating its mass base of support, as both the IRA and the ETA in Spain have independently discovered. The car bomb is an inherently fascist weapon. Fifth, car bombs are highly anonymous and leave minimal forensic evidence. Buda quietly went home to Italy, leaving William Burns, J. Edgar Hoover, and the Bureau of Investigation (later, to be renamed the FBI) to make fools of themselves as they chased one false lead after another for a decade. Most of Buda's descendants have also escaped identification and arrest. Anonymity, in addition, greatly recommends car bombs to those who like to disguise their handiwork, including the CIA, the Israeli Mossad, the Syrian GSD, the Iranian Pasdaran, and the Pakistani ISI — all of whom have caused unspeakable carnage with such devices. This article was a preliminary sketch, edited by Michael Sorkin, that became the book Buda's Wagon: A Brief History of the Car Bomb. Both Part One and Part Two can be read on TomDispatch.com — an online journal that provides "a deeper understanding of our post-9/11 world and a clear sense of how our imperial globe actually works."